I know…four days in and I’ve already jumped the healthy bandwagon. Will you forgive me for taking a one day break? 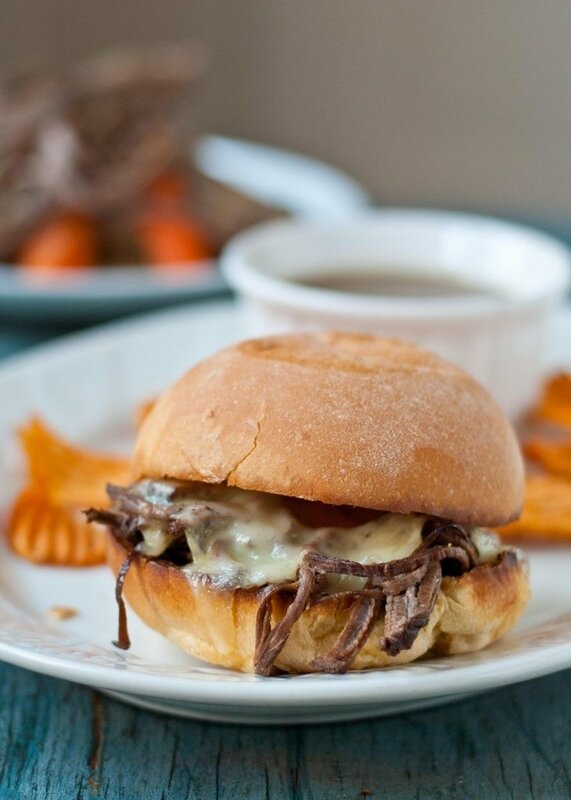 Because these Slow Cooker Beef Brisket French Dip Sandwiches just can’t wait until February. It wasn’t supposed to be this way. This was supposed to be a nice simple beef brisket served with a pile of carrots, onions, and potatoes. Sure, it wasn’t exactly the picture of health, but it was a complete meal made right in your crockpot. I blame the brisket for this mess. It was just so darn tender. And the broth? The wine made it so rich, so perfectly dunkable. The brisket literally fell apart. It was like a love struck school girl–I barely looked at it and it fell to pieces. And before you know it, I was slathering buns with butter and smothering that brisket in gooey melted Swiss. It was an accident. The really happy kind. Guys? These sandwiches are really, really good. And the whole process is made so easy by the trusty slow cooker. I did brown the beef in a skillet for a short time before throwing it in the crockpot, but other than that, this is a dump and go recipe. The brisket cooks low and slow in a beef and wine broth seasoned with rosemary and bay leaf. Once the beef is done, you just pile it onto the sandwiches, add your cheese, and give it a quick turn under the broiler. I’ve never really had a french dip sandwich before, but now I can say with confidence that you haven’t really lived until you’ve dunked your sandwich in savory, beefy liquid. It’s an entirely new experience. One I insist you try as soon as possible. If you’re not interested in cooking the carrots and potatoes with the beef, feel free to leave them out. I do suggest you keep the onions though. They really put the sandwiches over the top. 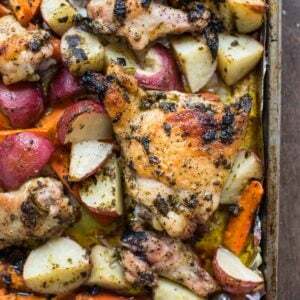 Or, if you really must, I supppoooose you could skip the sandwich thing and serve this dinner as it was originally intended-on a pile of slow cooked veggies. Either way, you’re gonna love this beef! 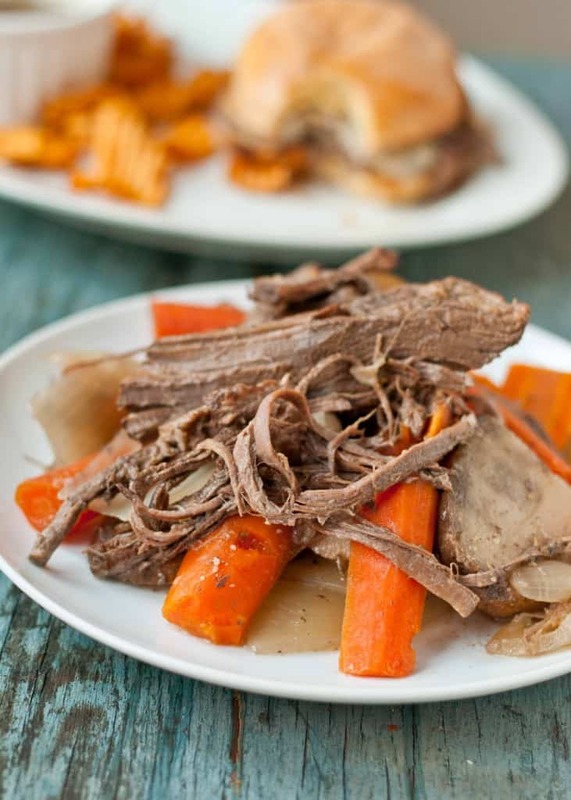 The #SundaySupper team is easing into the New Year with a whole line up of slow cooker recipes. If you’re looking to simplify your evening dinner routine, this is the post for you! Check them all out below the recipe! P.S. Because it’s January and I know you all are trying to eat healthier, I also made you a salad to go with the brisket. You’re welcome. P.P.S. If you’re looking for a good slow cooker, this is the one I use. It handles roasts like a boss and turns pork into fall apart tender, sandwich-ready BBQ. Five years and still going strong, this is a work horse in my kitchen. Add oil to a large skillet and heat over medium heat. Cut any large hunks of fat off the brisket then season it generously with salt and pepper on all sides. Add the brisket to the hot oil and cook until browned on all sides, 2-4 minutes per side. Place the onion, carrots and potatoes in the bottom of the crockpot followed by the brisket. Sprinkle with garlic cloves, rosemary, and bay leaves. Add the broth and wine then fill with enough water to cover all of the beef and vegetables. Cook on low for 8 hours, then high for an additional hour. ** Remove the bay leaves before serving. Remove the brisket from the crockpot and shred it. Butter both sides of the buns then place them under the broiler on low for 2 minutes or until browned and toasted. Pile the bottom half of the buns with the briskets and a few onions followed by 1-2 slices Swiss cheese. Place that half of the sandwich back under the broiler for another 2 minutes or until the cheese is melted. Top with the other half of the sandwich bun. Use the remaining broth from the crockpot as the "dip" for the sandwiches. Dunk and enjoy! **Note: Since I work during the day, I can't really set my crockpot to high, but if I didn't I would probably cook this on high for 6 hours then turn it down to low for another 2-4 hours. It wasn't quite fall apart tender after 8 hours on low. I think it benefits from the high cooking time. Looking for more crock pot recipes? Check these out! Note: Neighborfoodblog.com is a participant in the Amazon Services LLC Associates Program, an affiliate advertising program designed to provide a means for us to earn fees by linking to Amazon.com and affiliated sites. I love French Dip. I bet the vegetables gave it just the right flavor! Carpe diem! Cheese – like ice cream – is a necessity of life! 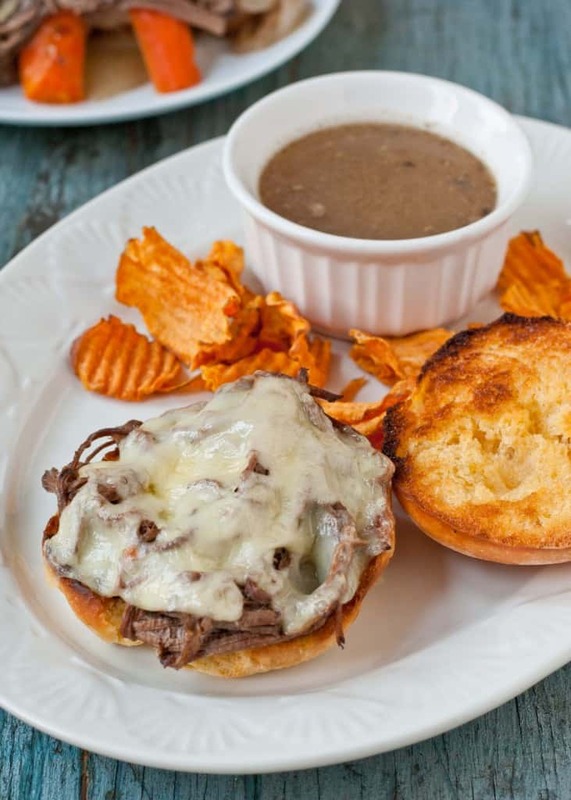 I’d love to try a French Dip Sandwich in NYC! That sounds wonderful! I’m drooling over your pictures and recipe! 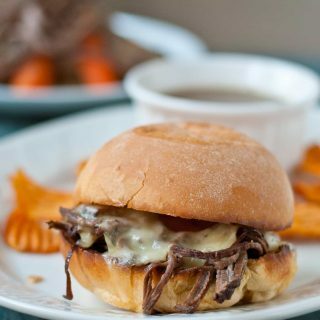 French Dip is always such a fun dish. Definitely pinning to try later! Thanks Marjory! I hope you love it as much as we do. Are you kidding me? The photos in this post have me *swooning* over your sandwich. Not fair I tell you. Not fair at all! LOL CRAZY GOOD recipe!!! My stomach literally started growling when I looked through your pictures. I love brisket!! This looks divine. Thanks for sharing! I”m SUPER jealous of this brisket. My hubby smoked some brisket in his new smoker yesterday, and it turned out…. a little dry. It wasn’t really his fault – it’s so cold here that I think temp control was a problem. But needless to say, after a dinner of dry, not-so-great brisket last night…..seeing this this morning is making me super jealous. Drooling! What a bummer! I’ve never attempted smoking, but it seems like it’s its own special art. This was definitely not dry, and it was so easy! You did the right thing! It looks yummy on a bun, smothered in cheese! My mouth is watering. Send me one through ciberspace! Oh wait, you can’t. Bummer. I bet they’re all gone anyway. Thanks for sharing & HUGS! Everything is always better when it’s smothered in cheese! Mmmmm something about cheese and dipping that just gets me every time! Thanks for sharing. I LVOE accidents like this! Holey socks this looks good! They’re the best kind of accidents, aren’t they? Well I’m glad you fell off the bandwagon, because this recipe looks and sounds delicious. Nice to find you through Sunday Suppers. Great to find you as well! Thanks for coming by! Those sandwiches look delicious! I love the french dip, as well! This is a dish my kids would love! These look SO good! I’m trying to cut back on carbs but yeah this is definitely being pinned for a splurge. Yeah, so glad you didn’t wait until February to share this one! I love french dip sandwiches but sometimes the meat can be tough. Not yours, I can clearly tell this is a melt in your mouth sandwich. I was very pleased with the way they turned out. I’d never made brisket before, but I should have known I could trust my slow cooker to turn it into a fall apart in your mouth treat! Well, since you insist…don’t mind if I do! This is one of my absolute favorite ways to use the slow cooker. It makes such an amazing sandwich!!! Your recipe looks fantastic!! I wants it, I wants it right now. Already printed the recipe and adding the ingredients to my shopping list. Freaking excellent recipe. Thanks Renee! Hope you love it as much as we do! Ooooh man, all of the cheese! That juiciness! This has to happen in my life, pronto. Gaaaahhh I just got drool on my computer. Oh, these look simply stunning. 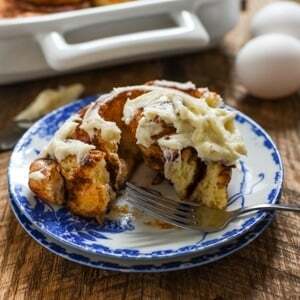 A weekend food project that has me salivating at my screen, even though it is only 10:30am! I made this recipe for dinner tonight and IT WAS AMAZING. 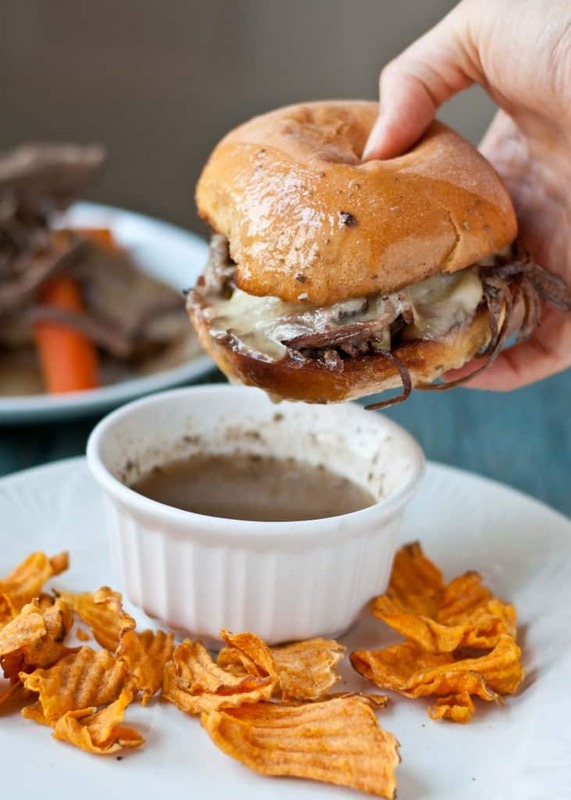 I’ve never even been a fan of au jus, but man…..awesome recipe! I am so glad you liked it! Thanks for taking the time to pop over and comment! I cannot WAIT to try this. Sometimes, accidents are a blessing in disguise! These look wonderful I can’t wait to try. Do you remember what kind of wine you used or is there one you would recommend? Red wine isn’t really like white in the sense that it can be classified as “dry”. “Dry” red wine would be one with a low alcohol content. I would guess that medium priced Cabernet Sauvignon or Pinot Noir would be a good match for this cut of meat since it can be a little “fatty”. I use about a $12-$15 Pinot when making Beef Bourguignon and will use the same for this. Remember, if you wouldn’t drink it, don’t cook with it! I hope you love it as much as we do! Have a great Sunday Supper! I am making this tomorrow I am wondering do I really need all the veggies I am just making the sandwiches and I will use the onions but I don’t really need all the others? You don’t have to include all the veggies. Just make sure you keep the onion, garlic, and seasonings. Hope you love it! For a 2 lb. brisket, if you were home all day you would cook on high for 4 hours then on low for … How long is “the remaining time”? Hi Karen, I would cook it on low for an additional 2-4 hours. I’ll change that in the recipe to make it more clear! Thanks! Pretty sad, working on the brisket right now but I don’t think I realized just how small my crock pot actually is… There is no room for the veggies. I think I need to buy a bigger crock pot! Oh no! I hope you enjoyed it even without the veggies! Sounds like a good item to add to your wishlist! just made this and is was so amazing…. but now I don’t know what to do with all the extra sauce and veggies. any good to make anther meal out of these? So glad you liked it! The broth and veggies could make an excellent base for a soup. You may need to add a little more beef broth, but you could add rice, noodles, lentils, or other meat. You could probably also thicken it by adding a cornstarch slurry and use it as a sauce over egg noodles. Good luck! Oh man, that’s a good question! I think they were some kind of onion rolls. I haven’t made this recipe….. yet (it’s on Tuesday nights menu)…. but when I cook a roast in the crockpot, I never cover the entire thing with water (or other liquid) it seems to dry it out. I cover about half of it, cooked on low all day while I’m at work, and they are always fall apart and tender. I will most likely do the same when I make this. More liquid dries it out? I’ve never had a problem with more liquid making it dry. I would use the full amount for this one. I know… seems a bit ironic, but my family can definitely tell the difference when I use less liquid. We’ll see how this recipe turns out w/ less liquid…. in the crockpot now. It will definitely be cooked through in 6 hours but it might now be as fall apart tender. This looks amazing! Your pictures are beautiful and makes me want one now! I made this tonight and found the broth a little watery tasting and added another bouillon cube a couple hours prior to serving. I also found (and maybe it was just my slow cooker) that it was not very tender after 9 hours and would perhaps turn it on high a little earlier. Otherwise, very tasty and my boyfriend loved it. Thanks for coming back to let me know! I definitely do think this benefits from as much high heat as possible. I’ve changed the recipe to reflect that. Did you make the sweet potato chips? if so did you bake them. I’d love the recipe too. Unfortunately I didn’t! I think they were the the Food Should Taste Good brand of kettle cooked sweet potato chips. I made this two nights ago, after putting it off for months, it was seriously so good! I made it exactly by the recipe, carrots, potatoes and all. It was fantastic. The husband and son raved about it. It’s almost like I got two meals out of it, we did sandwiches one day and had the meat and veggies the next. It was so flavorful and moist after 4hrs high, 4hrs low. Definitely a major keeper.Thank you! The only thing I did was pass on the swiss to use up our muenster, it was good, but a nice stinky swiss would have been even better. Awesome recipe, I’m already planning on making it again when the whole family is here to show off lol! Trader joes has cheddar and horseradish potato chips that go so well with this recipe its scary! I am so glad it was such a hit! Thanks for taking the time to come back and let me know. And I am DEFINITELY going to be getting some of those cheddar horseradish chips. That sounds amazing! This sounds wonderful. I do have one question – did you make it with a fresh brisket or was it the cured ones (vacuum sealed pkg) that can be found in abundance around St Patrick’s Day. It’s on right now. If you were doubling the recipe, what ratio of high/low heat would you use? Also, the very top 5% is uncovered, Is that okay? I would cook on high for 6 and then low for an additional 2-4. It’s fine for a bit of it to be uncovered, but I would maybe it flip it halfway through so that part doesn’t get dry. I hope it turns out wonderfully for you! What kind of dry red wine did you use? I don’t remember the exact brand I used, but a Cabernet Sauvignon, Merlot, or Pinot Noir would all be good options. i used red cooking wine…i really hoping it turns out. How did the cooking wine go? I used cooking wine and it came out really good. I ended up using the whole bottle because my brisket was a bit larger than the recipe called for. This dish was amazing, we made it on the 4th of July with friends coming over so I wouldn’t be in the kitchen the whole time and they raved about it for days afterwards. I made this a few nights ago and it was absolutely delicious. We had this for leftovers 3 nights in a row! When we buttered our buns I used a garlic butter because we love garlic and it made it even more tastier. I am so glad you enjoyed it so much! The garlic toasted buns sound amazing! How many servings did this yeild? It will make about 8 sandwiches. This sounds amazing. thanks for putting up this recipe. This recipe is delicious! I’ve made it several times. I hope you don’t mind, I put a link to your recipe in our blog! I’m so glad you like it. Thank you for sharing on your blog. I really appreciate it! I’m curious about the type of buns you used. I imagine it’d have to be something fairly sturdy to hold up to the dipping — not regular hamburger buns. The ones in your picture look almost like a brioche bun. At any rate, I have the brisket in the crockpot and will grab some kaiser rolls or similar later. Can’t wait! Thanks! Yes! Sturdy buns are definitely needed. I can’t remember what these exact buns were, but I usually scout something out in the bakery section of our grocery store. An onion roll is really good, too! I hope you enjoyed the recipe! So which is the preferred method to cook… low or high in the crockpot? Do you think I could substitute red wine vinegar instead of actual red wine? I wouldn’t recommend it. You’ll likely end up with really sour beef! I put this in my crockpot at 8:30 this am on high. At about 12:30 it smelled so good. I then turned the heat down to low, and by 4:00, it was pull-apart tender, so I turned it back to warm. I’m not real fond of wine, so I only used 1/2 cup dry red wine and made up the difference with beef broth. This was THE most delicious French Dip I’ve ever had/made! It was incredible. I give it an A++++. I served it to my family in honor of my daughter’s 32nd birthday tonight. Everyone loved it! Wonderful! I’m so thrilled you enjoyed it!